There is no question that Volkswagen has been on a sales tear in North America, and with new offerings like the Jetta TDI, one can see a bright future indeed. We had the opportunity to spend a week behind the wheel of a 2014 VW Jetta TDI to see just how far clean diesel has come in the past few years. 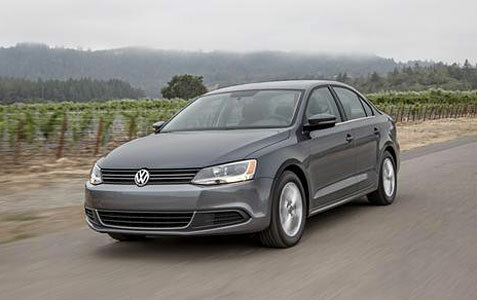 The Jetta remains Volkswagen’s best-selling car three years after the sixth-generation car was introduced to the U.S. market as a 2011 model. When you take a look at this Volkswagen, it’s clear that they never rest on success and are continuously striving to make its vehicles even better. The platinum gray metallic with 17-inch alloy wheels on the 2014 VW Jetta TDI we tested looks very modern with a clean and upscale look. Marketing experts call it “class-up appeal.” It’s the offering of more, for less. Which is why, when Volkswagen completely redesigned the Jetta, it crafted a bigger car, with a longer wheelbase and 2.9 inches added to the overall length. The increased dimensions allowed designers to incorporate clear, precise lines and muscular surfaces to impart a timeless elegance, giving the impression that this is a car from a higher class. At the front, the coupe-like incline of the windscreen and the consistent use of horizontal lines define the Jetta’s design. The horizontal blades in the grille, together with the blades in the lower intake, are designed to make the Jetta appear wider and more dynamic. To give visual weight to the lower part of the Jetta and impart a sense of the car being ‘planted’ to the road, the base of the doors is eased outwards. The pronounced wheel arches also add visual width and weight to the car. The overall theme of a clean and modern design carries over into the cabin of the 2014 VW Jetta TDI appearance. Just open any of the Jetta’s wide-angled doors and the quality of materials, the fit and finish, and the clean, simple, refined elegance of the cabin is clearly visible. And in true German tradition, the layout of the fascia, the positioning of the switches and controls, and the clarity of the oversized, round instruments is designed to be ergonomic and intuitive. Trunk space also borders on the cavernous. The Jetta offers a class-leading 15.5 cubic feet of usable trunk space, and can be increased significantly by folding forward the 60/40-split rear seatback. The rear seatback is also offered with a pass-through to accommodate longer items, like golf clubs and skis. A key benefit of the Jetta’s extended wheelbase – it stretches an incredible 104.4 inches – is a truly spacious interior, with impressive rear-seat legroom of 38.1 inches. Long legs can rejoice. The gently arcing roofline also means more than ample headroom of 37.1 inches for rear-seat passengers. And stretch-out legroom in the back isn’t achieved by a cramped front seat either. Being tailored for an American audience, there is no shortage of legroom and headroom up front. The seating surface is also leather with the sometimes cheap looking and feeling leatherette. Plenty of options were on hand, including Sirius XM radio, media device interface with iPod cable, Bluetooth mobile telephone connectivity, A/C, heatable front seats that warm up very quickly, rear seat arm rest, cruise control, height adjustable telescoping steering column, leather-wrapped steering wheel, shift knob and hand break lever, power windows with pinch protection, power heatable exterior mirrors with turn signal indicators, power sliding moonroof, RNS 315 touchscreen navigation system, push button start and rear view camera system. The Fender premium audio system was developed through collaboration between Fender and Panasonic, cranking out 400 watts of power played through nine speakers, including a trunk-mounted subwoofer, to bring the raw emotion of a live music performance to the driving experience. We’ll talk fuel efficiency first, because there is definitely the wow factor going on here! A favorite engine choice among Jetta buyers is the highly efficient 2.0-liter turbocharged inline four-cylinder TDI Clean Diesel engine that, as tested, produces 140 hp and 236 lb-ft of torque. With the DSG automatic transmission, the Jetta TDI can, according to EPA estimates, average 30 mpg in the city and an impressive 42 mpg on the highway. 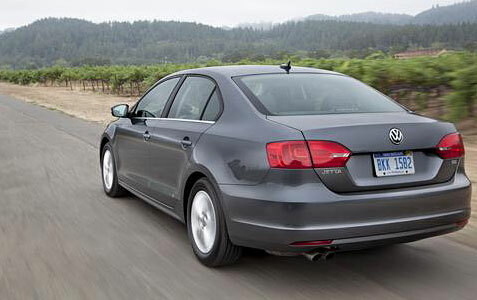 That enables the Jetta TDI to cover up to 609 miles on a single tank. Those numbers should have North American buyers taking another look at the new clean diesel option. The ride of the Jetta TDI was smooth as silk with just enough feel of the road to make a case for those looking for a sporty ride. All Jetta models are fitted with a strut-type front suspension with coil springs, telescopic dampers and an anti-roll bar. For 2014, the torsion-beam rear suspension that was fitted to the 2.0L S, 2.5L, and TDI models has been replaced by a sophisticated multilink independent arrangement that features three transverse and one longitudinal link per wheel. This enables the longitudinal and transverse dynamics to be precisely configured almost independently of each other. The result is more agile, responsive and precise handling. All Jetta models have an anti-roll bar as part of the rear suspension. We found the Jetta TDI Premium to be very nimble in tight corners with plenty of power to navigate through traffic. This is another winner climbing the sales charts for VW, and for a price as tested of $28,235, the 2014 Jetta TDI Premium is also a bargain. The sharp design and no clutter interior are refreshing, but we could do without the leatherette seating. The Jetta is competing strongly in a segment that can deliver booming sales to VW. With highway ratings of 42mpg and up to 609 on a tank of clean diesel, there is no doubt this car will drive sales.